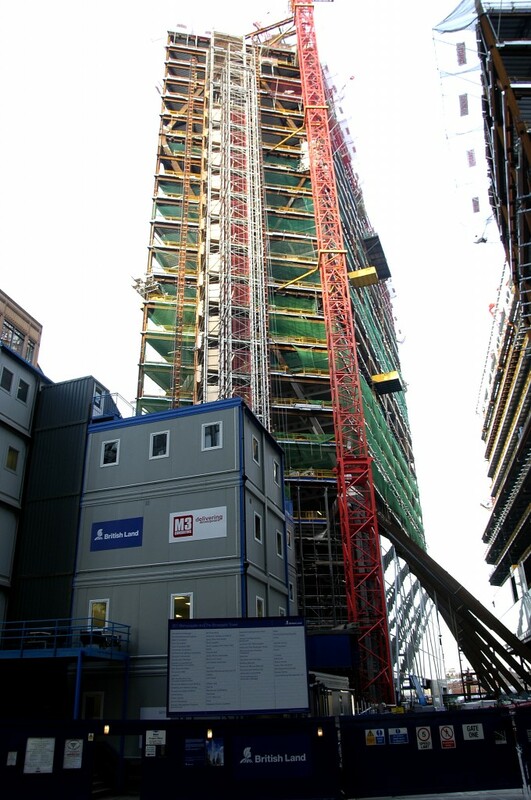 Broadgate Tower is built on a raft weighing 6,000 tonnes over the rail tracks that run above it to Liverpool Street Station. 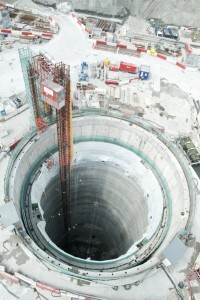 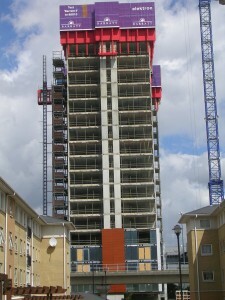 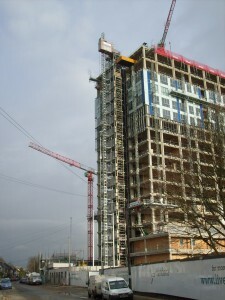 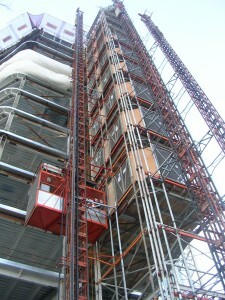 This means there is a requirement to distribute the weight of the tower, and hence no concrete core. 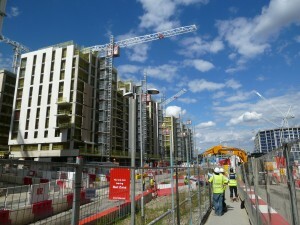 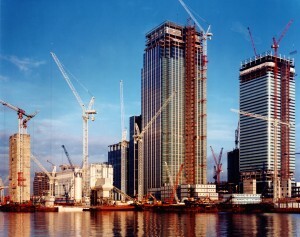 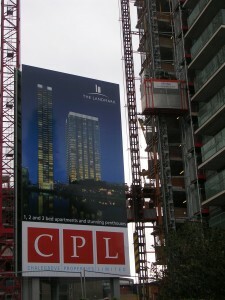 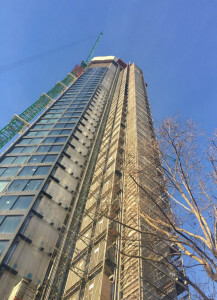 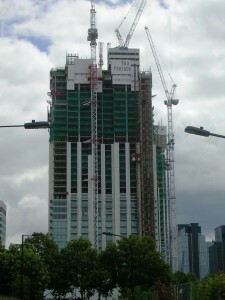 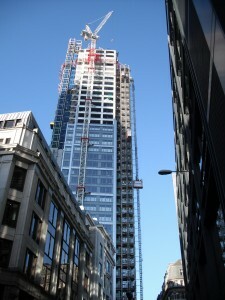 The scheme comprises two buildings: the 13-storey 201 Bishopsgate and the 35-storey Broadgate Tower, which at 161 metres tall is the City’s third tallest building. 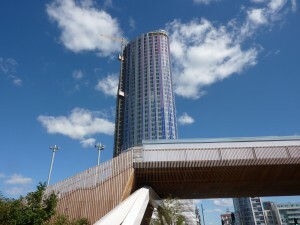 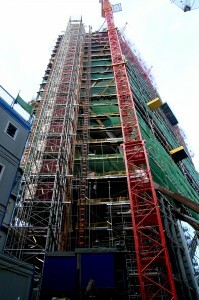 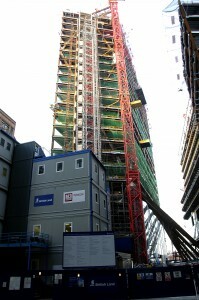 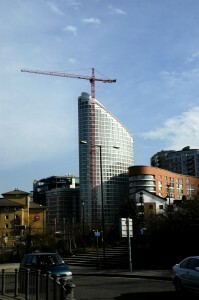 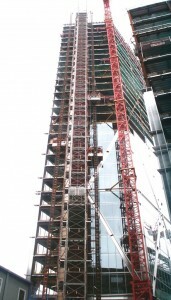 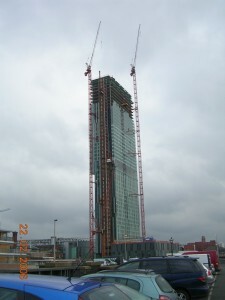 The 35-storey (161 metre) Broadgate Tower is shaped like a parallelogram stretching north-south along the site. 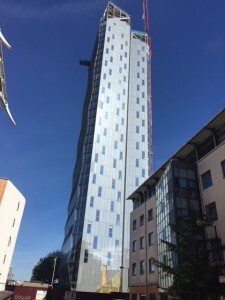 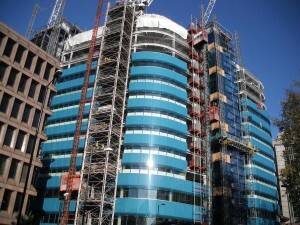 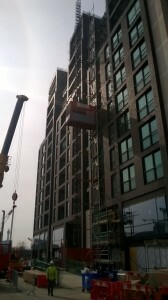 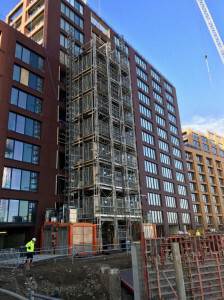 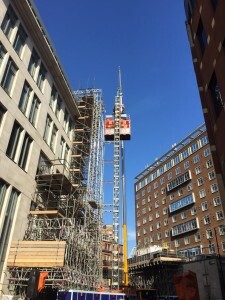 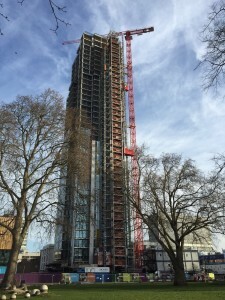 There is a five storey entrance lobby on the south end with ten double deck lifts (the first to be used in a new-build project in the UK), and onward access to 201 Bishopsgate at the north end. 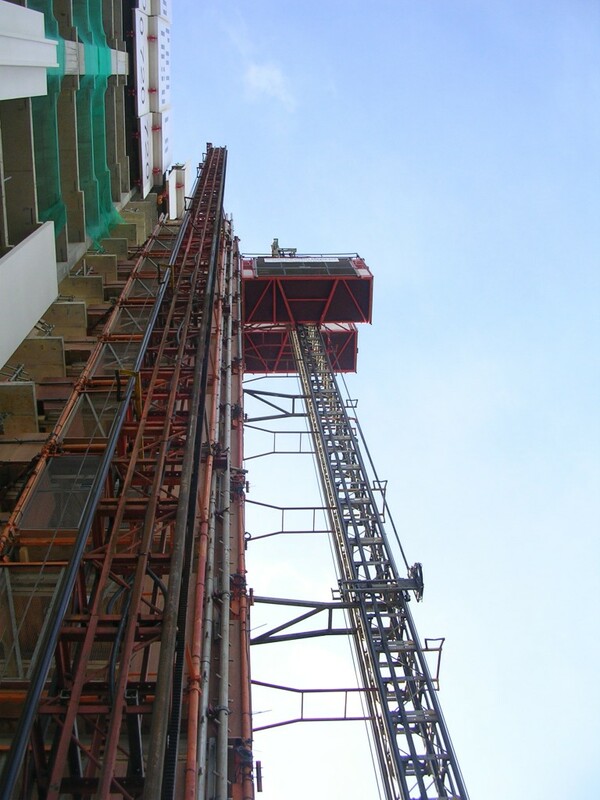 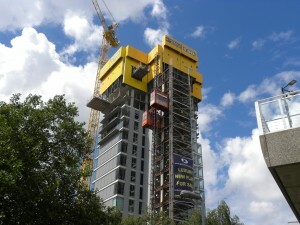 On the Broadgate Tower the hoisting consisted of three 2800kg, 90 mtr/min high speed passenger / material hoists arranged around a common tower and a specialist large high speed material hoist with an operating payload of 2000kg and a speed of 139mtrs / min. 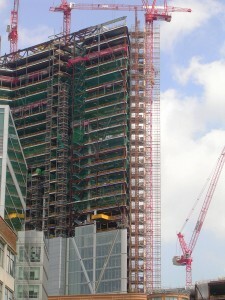 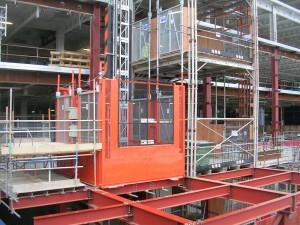 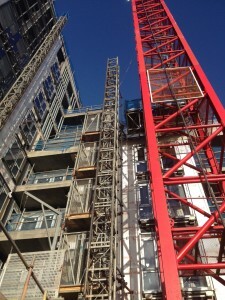 Broadgate Tower twin passenger hoists and common tower by UBS. 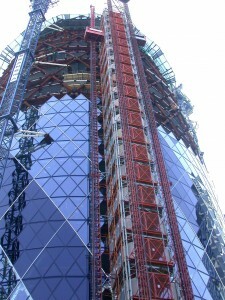 Broadgate Tower twin passenger hoists with UBS common tower.